On Friday, December 5, 2008, almost 2000 children and friends of the Centipede gathered in the ballroom of Lucerna in Prague to see this year’s Christmas concert of the Centipede. There were more reasons to celebrate – Centipede has also celebrated its 18th birthday. 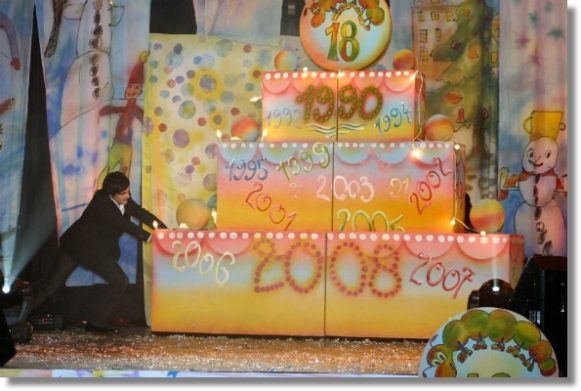 At 3 p.m. sharp, Vojta Kotek, the presenter of the evening, with the help of the children of the elementary school in Kladská, pushed a huge cake to the stage, and welcomed all the Centipede cooperators and guests. He invited Mrs. Bìla to the stage; she thanked to all Centipede children and other co-workers for their wonderful work for the movement. She shortly remembered the beginnings when she was selling the first Christmas cards in front of the shopping malls in Oslo. Immediately after Mrs. Bìla´s speech, the winner of the last Super Star contest Zbynìk Drda sang a couple of his greatest hits. Then the Centipede friend Pepa Vágner appeared on the stage. The first song “Mindrák” which was composed especially for the Centipede project “No Bullies Fashion” made everybody to clap their hands. Lots of children joined Pepa and sang with him. During the last takes of the song Pepa was literary flooded with flowers and teddies from the grateful audience. During the hit that followed – “Love or Friendship” – the whole hall was standing. Then the young singer Sandra Bell – came to the stage; her performance was a success as well. Vojta Kotek invited the congraturators to the floor – the director of the elementary school in Kladská Mrs. Kateøina Vávrová, the head physician and director of the psychiatric hospital for children Iva Hodková, a long-term co-worker of the Centipede Lt-Col. Petr Milèický and the vice chief of the staff of the Army of the Czech Republic General Major Josef Prokš. They thanked to all the children for their work and wished all the success in future. The end of the concert was coming and Mrs. Bìla and Pepa Vágner got to the stage again; above the heads of the spectators a wonderful wave of hands appeared. Many children joined in singing the Centipede anthem at the very end of the concert. We are looking forward to see you all next year – in December 2009. In the evening that followed, a traditional meeting of the adult cooperators and friends of the Centipede was organized in the New City Town Hall in Prague. Many respected guest accepted the invitation – Gen. Josef Prokš and his wife, Gen. Josef Šíba Ambassador of the Kingdom of Norway His Excellency Peter Nicolay Rader with his wife, patron of the Centipede and former Senator Dr. Richard Sequens with his wife, advisor to the minister of Defence Dr. Victor Meca, musician and producer Karel Vágner and many others. Mrs. Bìla reminded everybody of the fact that the first cooperator of the Centipede from the Czech Army was Gen. Josef Šíba and handed over to him the „Golden Centipede award“ at this occasion. During the evening, a long-term friend of Centipede Major Karel Kout called from the place of his current posting – Lógar, Afghanistan, and wished all the best to the Centipede on her birthday.